Recipe: Dough you wanna build a snowman? I live in a small town north of Colorado Springs where when it snows it SNOWS. Never a dusting. In fact, we’ve accumulated almost three feet of snow in the last three days. With that said, my sister and her three beautiful children came for a play date which turned out to be four days long because of the storm. And it may turn into five. It’s not easy cooking for nine people three times a day with a couple picky children and some indecisive adults. One of my go-to easy recipes is, well, simply dough. It’s a dough that’s interchangeable. 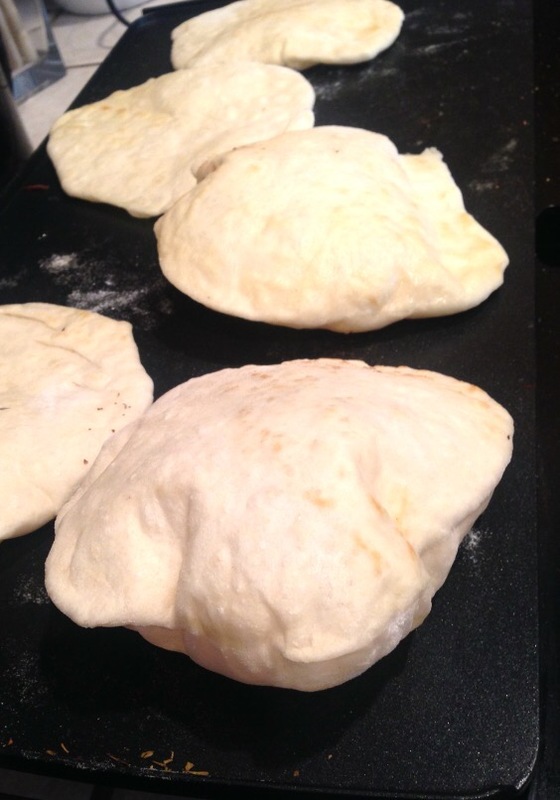 It’s a dough with which you can make pizza or different types of bread. In fact, the types of bread options are endless including sopapillas, etc. One could even do bagels, all with minor alterations. Our favorite is the pizza. I made it for my sister and our families for dinner on snowy evening No. 3 and they loved it so much my sister demanded we make it for lunch the next day. And this time she took notes so she could make it at home. This is coming from my sister who owns a bakery. In your electric mixer, combine honey, water and yeast. With your fingers, mix the ingredients only enough to dissolve the honey and ensure there are no clumps of yeast. The warm water activates the yeast and the yeast eats the honey. Put the mixture aside for 10 minutes. After time has past you’ll notice the yeast has changed color. It should be a tan color and foamy looking. This is how you know the yeast has not died. Using the paddle attachment on your electric mixer, you combine the salt and the olive oil with your bloomed yeast on low, gradually adding your flour. Depending on your location and the humidity there, you will need between 2-2.5 cups of flour. You will know you added enough flour to the bowl when the dough has formed into one large clump around the paddle and is slightly sticky. Prepare a separate large bowl which you will want slightly greased. 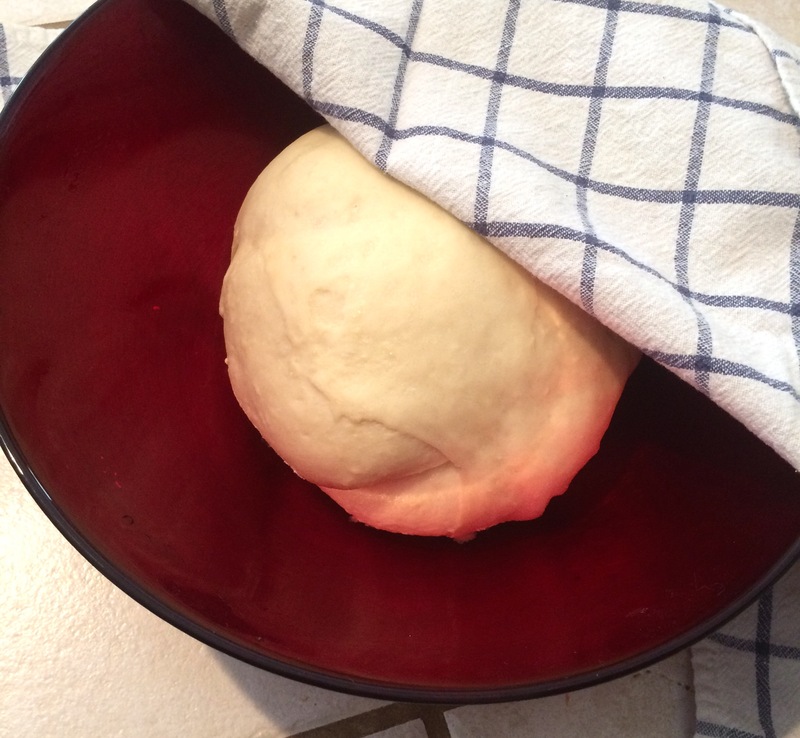 Take the dough from the paddle, knead it on a flat surface for 2-3 minutes until dough has become smooth. Place it in the greased bowl. Lightly grease the top of your dough. Cover it with a kitchen towel and set it aside for one hour. It’s time to cut your dough. My family prefers individual 6″ round pizzas. This will make about 10 of them. To make a 6″ round, pinch off a section about 1.5 inches in diameter. Keep flour handy in case the dough sticks to your hand or rolling pin. Rolling out the dough. You don’t want it to be perfectly round. You are not a pizza restaurant chain. Oblong and oval imperfect shapes make your pizzas look more authentic anyways. I’ve used this recipe on a grill, in an oven, in a sauté pan and today on a griddle. The toppings are up to you. In our blizzard event, we happen to have fresh mozzarella, tomatoes and basil on hand, so we banged out a series of margarita pizzas. We have left over pizza dough made and after nap time we will be adding a generous smear of chocolate-hazelnut spread, crushed graham crackers and miniature marshmallows. If your interested in doing the same, throw it under the broiler for 30 seconds to toast the marshmallows and ooze the spread. Skadoosh, smore pizza! Are you interested in learning our other variations?